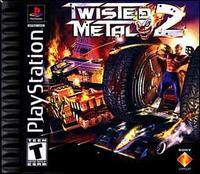 Race into destruction-packed madness with Twisted Metal 2. In this sequel to the acclaimed Twisted Metal, you are the speediest and meanest king of the road. Your task is to choose from more than 10 hi-tech, battle-hardened street machines like taxicabs, police cars, motorcycles, and ice cream trucks and compete in furious contests of brute force and GLADIATOR-style survival. In the tradition of films like DEATH RACE 2000 and ROAD WARRIOR, you'll smash through fully interactive 3D worlds as you crash from house to house, hi-rise to low-rise, and street to street in a frenzied attempt to escape your hellish pursuers and emerge on top. In Single-Player mode or Head-to-Head PlayStation-networked battle, you'll blitz through eight expanded worlds, shooting and maneuvering against bizarre foes and fearsome criminals. Engage in lethal warfare with majestic weapons like machine guns, flamethrowers, napalm, and homing-missile launchers. You can also switch between four camera views including dashboard POV and third-person perspective. In the psycho, tire-screeching, insanity of Twisted Metal 2 you'll need to dodge, dent and destroy your way to survival.